For large or small moving jobs, domestic or commercial, we offer a full removals service operating across London or anywhere in the UK area. 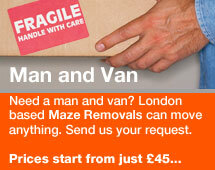 Our man and van removal teams have the equipment, experience and know-how to ensure your move is quick and efficient. 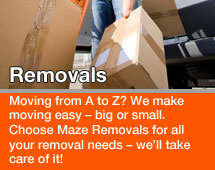 Maze Removals can arrange your packing and unpacking, general household repairs, cleaning and even storage. 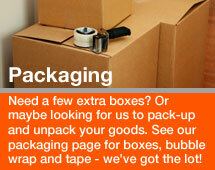 Get a free quote now or call us on 07847541036. 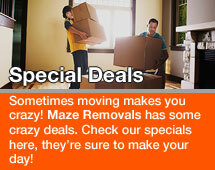 Moving is easy with Maze Removals!